I laughed out loud when my mother brought this freakishly huge, yard sale bowl ($2). Little did I know we'd soon be putting it to the test! I've never bought so many groceries in my life! We adapted a Once A Month Mom menu that called for over 40 pounds of meat alone. I hit Sam's Club for $1.39 pork chops and priced the rest with Kroger's sale flyer. With a couple of lucky buys, we kept the meat cost to an average $2/lb (my target price). I shopped and chopped the day before. Jessie prepped her kitchen, printed the labels, and mixed the spice blends. On Saturday we worked for 6 hours solid. I left exhausted, wondering if this frugal experiment would be worth our time and money. And then I realized how much filling my freezer with Stouffers could cost. Final bill: $125 per cook. Final product: 15 recipes, quadrupled and split between us. For more information, find my freezer packing strategy at Frugal Hacks, the recipes at Once A Month Mom, and thoughts from my partner in cooking. Sounds like a good way to spend quality time with a friend, as well as a great way to stock the freezer. I'm anxious to hear your opinion of the meals themselves once your family has tried them. I love the new look:) Very fresh! Isn't it fun to change things up some times? 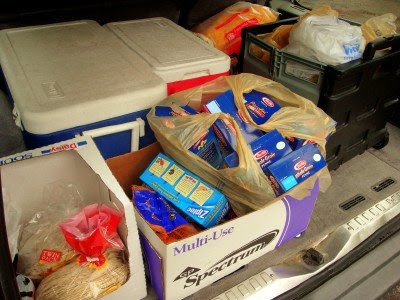 Looks like alot of food. I'm sure it will be wonderful to go to the freezer and pull out a meal to thaw. So that would cost $4 per person per dinner per day for 30 days? What a great way to stock up. Hey love the new look. I admire you for working so hard for the savings! I have no idea how this will break down, cost per person. What I can't predict is how many meals this will actually feed us, as a couple of the recipes are breakfasts and some are lunches, while some of the dinners would be more than we could eat at one sitting (pork chops). Also, the cost per meal does not always include vegetables, so that will fluctuate. All in all, I think this will not be the cheapest meal planning option, but it will definitely save us money if the alternative is takeout or convenience foods. OH MEREDITH! I was just here like two hours ago, and now your blog is all redone! I LOVE IT! So glad I decided to pop back over. So, so pretty! What a great idea...thanks for the links. I like your new look! About 10 years ago i did once a month cooking all the time! But never with a little baby in the house! You must be exhausted!!! It was great though to have those dinners already made and ready to pop into the oven. Wow, congratulations! I've thought of doing the OAMC but have never felt confident my picky (and allergic) eaters would like all that I could come up with. But I have been blessed by my step-mother filling my freezer when my 2nd was a few months old and it was awesome. Between leftovers and throw togethers like scrambled eggs & rice 20 meals lasted us a couple months. PS Exciting to have a new look. I think I might miss the old tag line but I love the regorganized categories. Love the idea of once a month cooking, but I've never quite managed it myself. I reckon the idea of cooking with a friend and sharing the meals is probably the key to success. When I first started freezer cooking, I was "ehh". Six years later, I'm "yeah baby!". You tweak and adjust methods and recipes so it fits YOUR family. Might I suggest you check these books out from your library? God Bless and thank you for having such a lovely blog!!!!! Love Merchant Ships' new look. Sounds (and looks) like it turned out great. LOVE your new design!! I love the new look! The OAMC has always intrigued me. Now with grown children it would not be so necessary. I loved reading about your experience. I used to fill my freezer like this when we had babies on the way. I think you will really enjoy having things ready to go. And, imagine how easily you could bless a family in need with a hot meal. I stopped doing OAMC because after all that cooking, I just couldn't face the food! Weird, huh? I LOVE the new layout!!! I've wanted to try once a month cooking for a while, but never have been organized enough to do so. This is excellent inspiration. And I love the idea of cooking with a friend! It WILL be worth it...when you pull it out to thaw and can enjoy your lovely afternoons you will wonder why you didn't do it before!! It relieves MUCH STRESS and it's definitely economical!! You will love being able to pull a meal out of the freezer! As for the bowl! 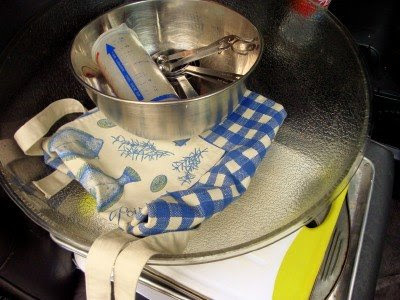 I have a selection of stainless bowls, small to humongous, that are handy for various tasks! All of them are yardsale finds! Hooray! Not sure if it's been mentioned, but the book "Dinner's in the Freezer" by Jill Bond (I think that's her name) is another good OAMC book. I have tried OAMC, as well as making extra portions and freezing them, with varied success. It certainly does come in handy when I am tired and tempted to eat out or order pizza. OAMC may not be cost effective where there is no temptation and a family always eats homecooked food, but that's not the case in my home! If it could save me from even 1 restaurant meal (which is often $40-50 for our family of 6), it would be worth it. Thanks for the link to 'Once A Month Mom' I've done a big cook 3 times now and more recipes and ideas are always helpful! I find OAMC to be very affordable, especially if you know next months menu ahead of time. Then you can start watching flyers for the ingredients you will need next time. 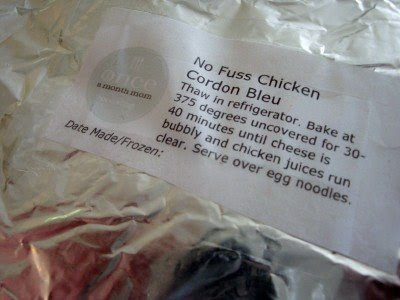 Oh my but this is a great idea for healthy recipes without all the additives and preservatives that I am allergic to. I love to double and triple my recipes so that I can just pull it out of the freezer and dinner is served for nights I am too busy to cook. Thanks for sharing. Great new look! Love it. Good job on all that cooking! You're going to be so loving the convenience. I'm a little confused why this way of cooking wouldn't be just as cheap as any other meal option you could do. Why is it only cheaper compared to takeout or convenience foods? If I did OAMC, which I never have, I would be making foods that I would make anyway, so why would it be more expensive? I'm curious. in order to do a BIG cook like this one, you have to buy everything at once. I can't buy ground beef at 99-cents a pound, freeze it until the cooking day, then thaw, cook, and refreeze without damaging the food quality. Normally I would just cook up the ground beef and adjust my menuu to make use of it right then, or I would put half of the browned beef in the freezer for later. As we shopped we knew we were paying MORE for some items because we were at the mercy of what was on sale this week. The big savings is not just in comparison to take out or premade frozen foods, but in what we will save by preventing eating out due to poor planning, etc. But the money - That's where I'm stuck - I think you did pretty good with 125 - What was your menu plan? Would love to have it so that I can copy it for fresh and new ideas! Just being honest! Pray that I break out of my comfort zone and can cook with someone else - lol! 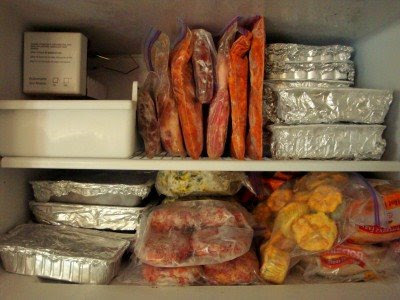 Your freezer looks so great full of homemade food! Much better...and healthier...than a freezer full of processed foods with little nutritional value. Good for you! Now...if I could just get a handle on making a WEEKLY meal plan I'd be doing good...! Sounds like a productive time! I need to start stocking the freezer for after the babies come, or for bedrest... whichever happens to come first. Hi Meredith. I'm a regular lurker here. I was wondering will you just eat these every day, or will you keep them just in case you need a quick meal? Do you do a menu plan? If you do, will you allow for these to be your busy night meals, or will they just get eaten when they get eaten. It looks fun and convenient. Meggan, I have earmarked a few meals for people who have just had babies, etc. Mostly the hashbrown casseroles because I don't like to serve a potato dish as the main meal (too starchy for my husband). I had visions of using them every other day but so far we are 2 for 2. Then there are other nights like the next 2 when we have dinner obligations with church, athletic team, etc. OAMC is an experiment for our family and I'll be sure to report back when we finish the freezer full!